Last edited by karan561 : 12th November 2015 at 16:38. Wow that was one crazy review you did there Karan. Hats off. Send a copy to the Ford India guys and I'm sure they'll put your review on their official website as well. Your white Figo looks like an absolute eye candy with those upgraded wheels and I'm sure its an absolute hoot to drive as well. Any enthusiast on a budget should go in for this car. Excellent fuel economy, stylishly designed, safety packed, fun to drive quotient, cheap to maintain and has decent space for a small sized family. Wish you tons of fun driving this new diesel rocket of yours. Keep us updated with the performance over the course of your ownership. Cheers! Fantastic "Video" Review @karan - Very innovative. Loved it thoroughly. Seriously Karan? IMO professional reviews only fare a wee bit better due to expertise team that supports them. What I loved about your effort is choosing the 1.6 GT TDi, as the car to beat. Having owned the GT TDI for nearly 2 years now, I had not experienced the same vigour on any other car with which the GT accelerates. And I am just floored with the way that Figo TDCI accelerates. I am just so excited about the fact that Indian automobile market is finally set for hot hatches. 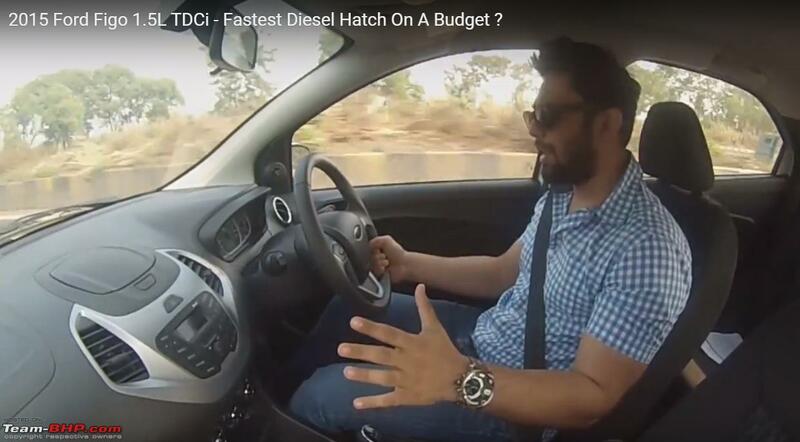 I have not driven the Figo TDCI yet, but after this video, I would want to experience this engine and car. Awesome review and personally one of the best in the recent ownerships reports man. 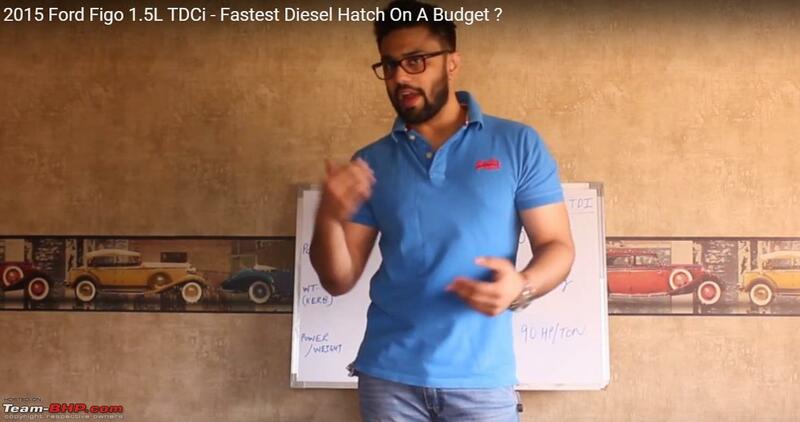 So I strongly agree with your belief that in today's Indian car scene, you don't have to pay through your nose to get some really fun-to-drive cars. Last edited by Vik0728 : 12th November 2015 at 17:17. Start your own auto show. Serious. Its far better, factual & grounded in reality than some of the claptrap that we hear by "experts" muttering on TV channels nowadays! Just one question: After the tyre & rim upgrade, have you had a chance to check the ABS cut-in threshold? Hope it works fine and the wheel sensors do not get confused by the additional grip on offer. Just a thought. Keep revvin' and Drive safe ! Last edited by arjab : 12th November 2015 at 17:25. So here starts the new evolution in team BHP - The ownership VIDEO reviews. Brilliant, and loved the comparison with Polo GT TDI. I don't know how much Ford has marketed its punchy engine with flamboyant ads, but this review has just done that. Oh and those MOMO alloys look really hot! They suit the car very well and uplift the looks by several notches. Last edited by amansanc : 12th November 2015 at 17:31. I still think you should have sprung up a little more dough and get the Titanium. I know you have much more capable machines for highway driving but still. I was very much impressed with the way you wrote the ownership report of the Renault Scala but this review has exceeded that. 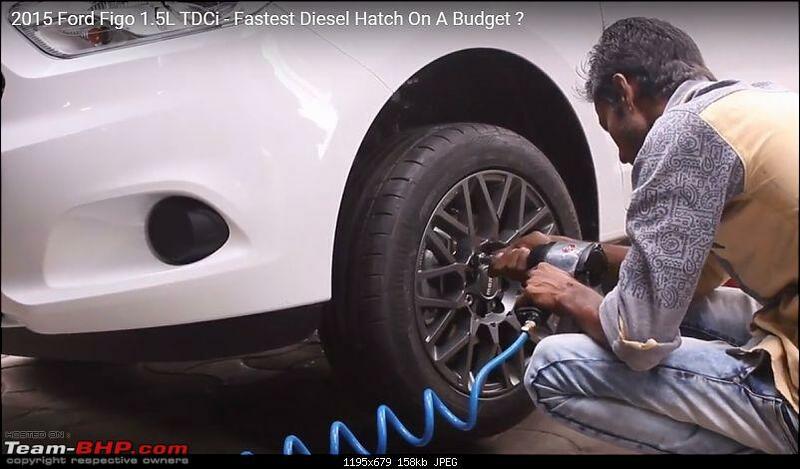 Going through your posts on the Figo thread , I thought you had upsized to 195 55 r14 .Only after watching the video I realized you have upsized to 15 inch wheels. The alloys are simply brilliant. Do share the cost of the alloys. Last edited by Ragavsr : 12th November 2015 at 23:21. OMG, the GT is overtaken by Figo. I'm yelling nooo with resounding echo in my head. Great review Karan and innovative too. How is the stability of the car on high speeds (after the wheel upgrade). Also, I wanted to know if there was torque steer on hard acceleration. 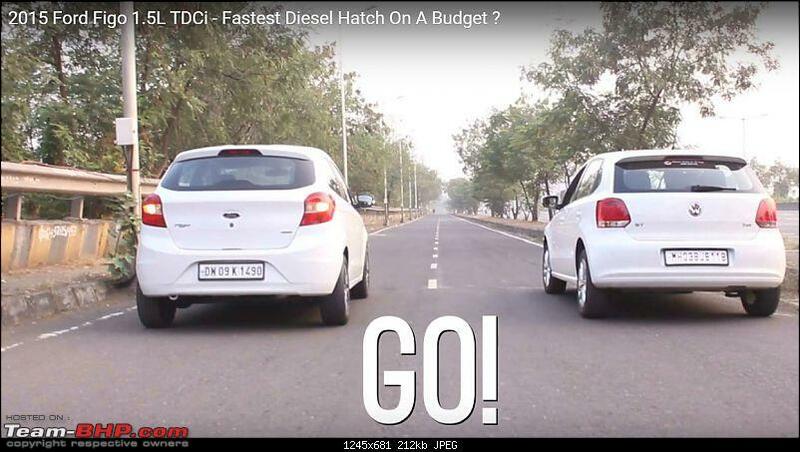 Thanks GameOfCars, yes the Figo is indeed a well rounded package for the enthusiasts on a budget. Thanks Vik for your appreciation. Thanks for your kind words arjab. I own the TREND variant and it does not have ABS. But IMO even if it had ABS a tyre/wheel upgrade would't have caused the ABS to act confused. Thanks petrol_power, I'm glad you liked the review. Ha Ha, well no kick at all. In fact your motorbeam's video of the Aspire (0-100km/h in 9.78 sec) gave me the confidence to pitch the Figo against the Polo GT TDi. Hey Ragavsr, Thanks. Yes the Scala review was truly special for me too. I agree with you, because on the limit when you have to brake hard the car needs ABS. The larger rims and tyres only give confidence to a certain extent, but to fool around you need that electronic gadgetry of the ABS to make you feel safe. The MOMO's (15") were purchased for INR 29k for a set of 4 & the tyres are Continental Max Contact 5 (195/55) purchased for INR 5400/tyre. The high speed stability is good but may not be as good as the Germans (Polo) dynamics. But yes after the tyre & rim upgrade it has improved. Last edited by karan561 : 13th November 2015 at 00:46. 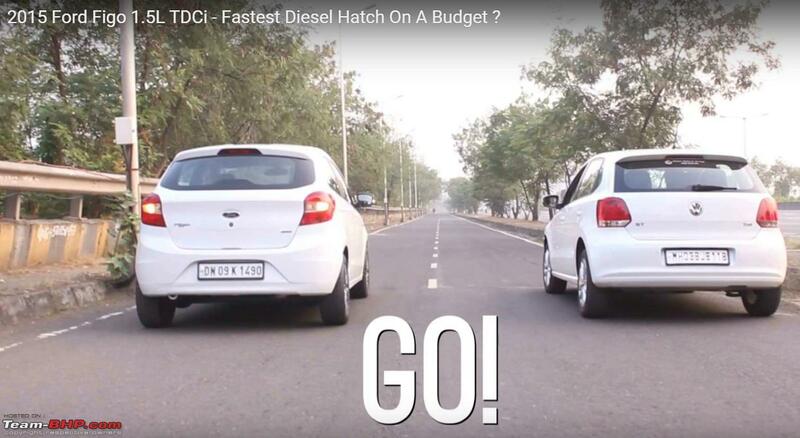 Really great video review KKC, your testimony for the Figo coming as a owner is like a bolt from the blue to many Aspiring buyers still sitting on the fence and confused whether they should join the new 'B' bandwagon buzz or think of product like the Figo as a equally credible option. 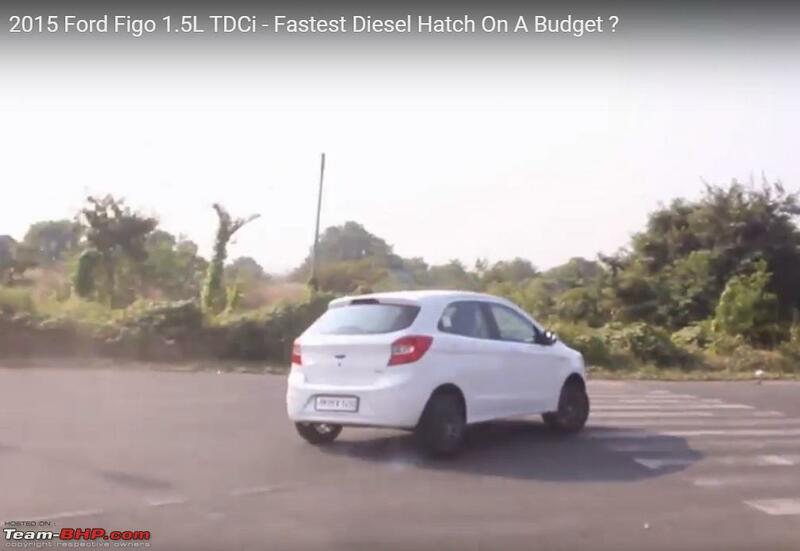 Ford is running campaign for Figo with "Clever like you" theme but I also feel they are missing big time on showcasing strength of the diesel engine which is let down to an extent by the petrol sibling. I completely agree. I took delivery of my Titanium Ruby Red 1.5 TDCI Figo on Friday. It is truly a joy to drive. It is not everyday that you can come up with an engine which delivers a combination of 100 horses and a mileage of 25 kmpl. They should be marketing this a lot better. Last edited by GTO : 14th November 2015 at 10:34. Great review Karen. I think the icing on the cake was the drag race. Love your choice of wheels. This really speaks volumes for the Figo and I am really impressed with its performance. Good job Ford. All the best and happy driving. Keep posting updates on your beauty. Great review. Video review is definitely entertaining than reading so many pages. 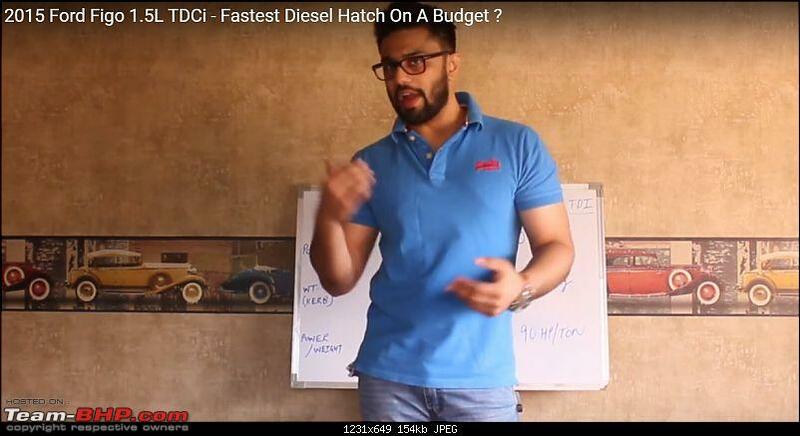 You should think about starting your own motoring channel. Giving a well deserved five stars. Love the wheels. It looks great on white colour. Happy to see that Ford did not go the normal route of other manufacturers - puny engines with stress on fuel efficiency. Great job Ford.